The bass solo from Saint-Saëns' Carnival of the Animals: The Elephant (Le Carnaval des Animaux: L’Eléphant) has been edited by Lawrence Hurst, former principal bassist with the Dallas Symphony Orchestra and Professor and chair of the String Department at Indiana University School of Music since 1986. Hurst's bowings, fingerings and other editorial markings have been added throughout the score. Carnival of the Animals by Camille Saint-Saëns is a Romantic musical suite comprised of 14 movements. It was originally written for private performance by an unusual ensemble consisting of two pianos and other instruments such as flute/piccolo, clarinet, glass harmonica, xylophone, and strings. Today it is usually performed with a full string orchestra or in a piano arrangement. Saint-Saëns regarded this composition as a piece of fun. Carnival of the Animals has become one of his best-known works, and it is a favorite of music teachers and young children. The Elephant is the fifth movement of the suite, scored for double bass and piano. It is the perfect caricature of an elephant, with the bass melody humming beneath a waltz-like triplet figure in the piano. It is also a musical joke, deriving its thematic material from Mendelssohn's Scherzo from A Midsummer Night's Dream and Berlioz's "Dance of the Sylphs" from The Damnation of Faust. While the themes were originally set for higher and lighter-toned instruments, in The Elephant they appear in the lowest and heaviest-sounding instrument in the orchestra, the double bass. 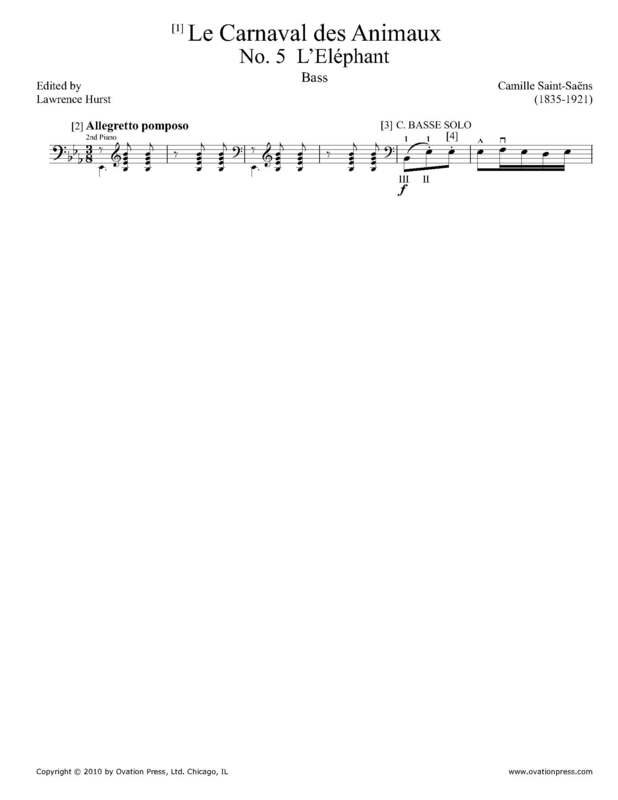 Download and print the score today to gain access to expertly edited Saint-Saëns Carnival of the Animals: The Elephant bass fingerings and bowings from Lawrence Hurst! Please note: There is one page of music encompassing the bass solo from L’Eléphant and one page of commentary & instruction. Camille Saint-Saëns composed the Carnival of the Animals in 1886 as a private joke. The creation took him only several days while he was on holiday.